Located in the state of Karnataka, Pattadakal is a beautiful complex of historical monuments and mainly comprises Hindu temples which were built several centuries ago. Therefore, it has a significant place in the hearts of historians and history lovers. It is located in the vicinity of Badami and Aihole, other two sites in Karnataka which have gained a significant position in the chapters of Indian history. Pattadakal is one such place in the state where tourists can literally feel themselves walking in the past. It has a history dating back to the 7th century during the reign of the Chalukya dynasty when it was one of the significant centres. Since then, Pattadakal has been a prominent religious site amongst Hindus. Today, it has marked its presence on the global map and tourists, especially history lovers, from all over the world visit in thousands every year. So, if you are longing for such a marvellous destination where you can delve deep down the Indian history and learn in detail about its development and formation, then Pattadakal is your stoppage this season. 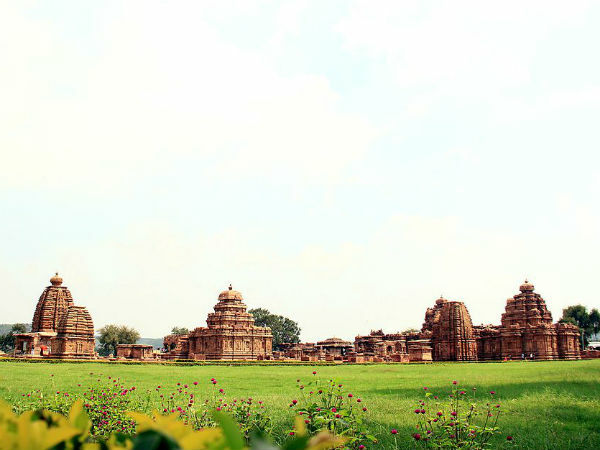 Pattadakal experiences a hot climate during the summers, and hence it is not a preferred destination for locals and other seasonal tourists during the summer season. However, it is a year-round destination for history lovers. If you would want to avoid the summer heat of Pattadakal, then the best time to visit it is from October until the end of February. By Air: The nearest airport to Pattadakal is located in Belgaum at a distance of about 165 km. Once you have reached Belgaum, you can either hire a direct bus or a cab to reach Pattadakal. By Rail: The best way to reach Pattadakal by rail is to take a train from Hyderabad to Hubli and then from there, a cab or a bus. The distance between Hubli and Pattadakal is 127 km. By Road: Being a popular tourist spot, Pattadakal maintains a good road connectivity, and therefore it can be easily accessed by road. As route 1 will take only 8 h and 30 min, i.e., half an hour lesser in comparison to the other route, it is the preferred route. On your way, you can also visit Mahbubnagar and Raichur and explore their natural beauty as well as historical sites. Mahbubnagar is located at a distance of around 290 km from Pattadakal and 100 km from Hyderabad and is mainly popular for its natural places which are present in the form of lakes and waterfalls. Over a period of time, it has gained popularity amongst unconventional travellers. The major places here include Mallela Theertham Waterfall, Pillalimarri, a 700-year-old banyan tree and Koilsagar Lake. If you are one such nature lover who loves capturing the beauty of incomprehensible nature, then Mahbubnagar should be your first en route stoppage. Raichur is one of the underrated tourist destinations in Karnataka. Despite housing numerous historical as well as natural places, it is known only amongst locals and a few offbeat travellers. The most significant places to be visited here include Aam Talab Lake, Ek Minar Masjid and Raichur Fort. It is located at a distance of about 190 km from Pattadakal and 210 km from Hyderabad. Finally, you will be within the boundaries of Pattadakal after covering a distance of about 400 km. The major places in Pattadakal comprise temples and a few monuments with inscription. Therefore, it makes for a perfect weekend getaway for history lovers. Following is the list of temples and other monuments which can be explored here. Read on to know more about them. Mallikarjuna Temple is one of the significant temples amongst the Pattadakal group of monuments as it has a history dating back to the 8th century when it was constructed by Trailokyamahadevi, the then queen of the region. The temple is dedicated to Lord Shiva and is known for its commendable stone carvings which portray scenes from the Hindu mythology. Another prominent site, Virupaksha Temple dates back to the mid 8th century and is a perfect spot to witness the beauty of stone carvings. From intricate designs to beautiful wall patterns, each and every corner of this age-old marvel is worth remembering. One of the most beautiful temples in the Pattadakal complex, Sangameshwara Temple is built in the Dravidian style of architecture and is known for its inscriptions dating back to the early 8th century. Surrounded by a lush green lawn and beautiful trees, the temple maintains a peaceful environment. Housing a Shivalinga and a Nandi statue, Kashi Vishwanath Temple is one of its kind. As per historical records, the temple is believed to be one of the highly revered sites and was visited by thousands of locals every year. Even today, you can find its age-old beauty intact. Apart from the above-given temples, other sites which can be witnessed and savoured here include Papanatha Temple, Jain Narayana Temple, Chandrashekhara Temple, Galaganath Temple and Jambulingeshwara Temple.